The 6th annual Daytona Beach Ratha-yatra festival on May 24, 2014 began with an opening ceremony at the Holiday Inn. Dedicated devotees led a kirtan for the pleasure of Srila Prabhupada and Their Lordships Jagannath, Baladeva, and Subhadra Devi. 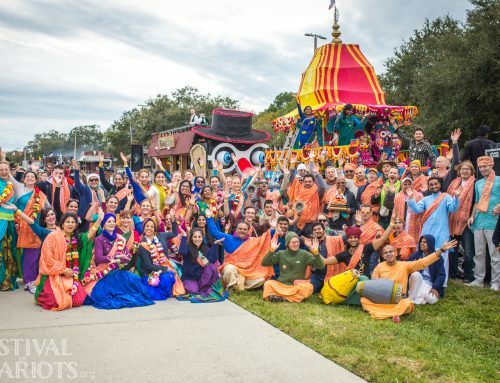 The kirtan was followed by speeches from Tammohara Prabhu, the GBC for Alachua, Florida, as well as the Vice-mayor of Daytona Beach, Patrick Henry, in appreciation of the significance of the Ratha-yatra festival and the devotees who take part in it. The Vice-mayor said that when his brother, Mayor Derrick Henry, told him about Lord Jagannath’s Ratha-yatra festival and the loving, caring devotees who participate in it, he studied more about it. He said he was touched by the message of this festival: that we are pulling Lord Jagannath, the Lord of the Universe, into our hearts, and that He is coming out to bestow His mercy upon everyone. 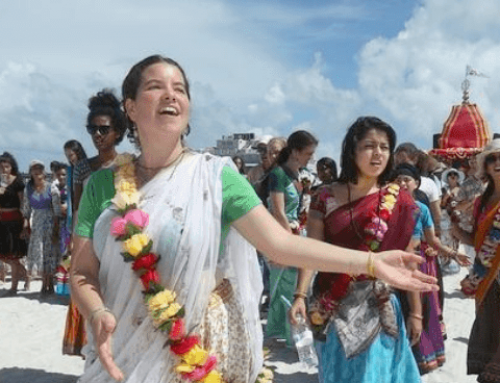 He exclaimed with great excitement that he was thrilled to host this festival for the Lord in the city of Daytona, and he glorified the devotees by saying that they were some of the nicest people he had met. He closed his speech by saying that people may attribute the economic abundance in Daytona to many factors, but he personally agreed with Tamohara Prabhu’s statement: that it was because the city of Daytona has been hosting Lord Jagannath’s Ratha-yatra festival for the past six years. Mr. Henry touched the hearts of the devotees assembled there, thus marking an auspicious beginning to the wonderful Ratha-yatra festival. After this, special thanks were given to Bhadra Prabhu, Dharmaraja Prabhu, and their families for their dedicated service to Lord Jagannath and the Ratha-yatra festival each year. This was followed by a dance performance by Anapayini Devi and Ganga Devi to the song Bhaja hu re mana by the saint and poet Govinda Dasa, and by a short drama about how the Hare Krsna maha-mantra can be chanted by anyone in any circumstance and uplift one to the blissful spiritual platform. As krsna-prasadam (sanctified remnants of the food offered to Lord Krsna) was being served out to everyone, Srila Prabhupada, Lord Jagannatha, Lord Baladeva, and Subhadra Devi were carried to their chariot with devotees accompanying them with an ecstatic kirtan for Their pleasure. Pran Govinda Prabhu began the kirtan as Lord Jagannath’s chariot was pulled along the shores of Daytona Beach. 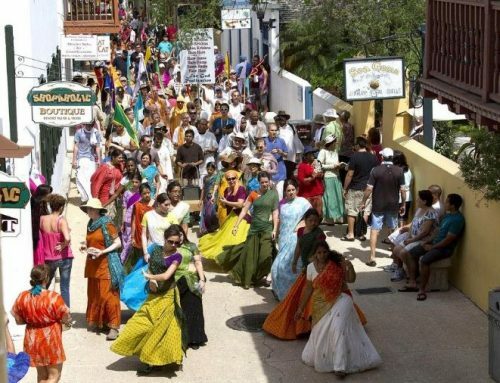 Many devotees took turns leading the kirtan and tourists gathered to see the spectacle and dance in the kirtan with the devotees. The procession ended at the festival sight, where more devotees were already leading kirtan. Lord Jagannath’s chariot was parked near the side of the stage so that everyone could have His auspicious darsana. Devotees and passersby alike saw dance performances by Anapayini Devi and Ganga Devi and students of the Bhakti Kalalayam Dance Academy, theatrical performances by Harinama Cintamani Dasi and friends and by the Krishna House devotees, and a concert by Krsna Tone that ended the festival with devotees and newcomers alike dancing to the upbeat music of Arjuna Abhimanyu Prabhu. 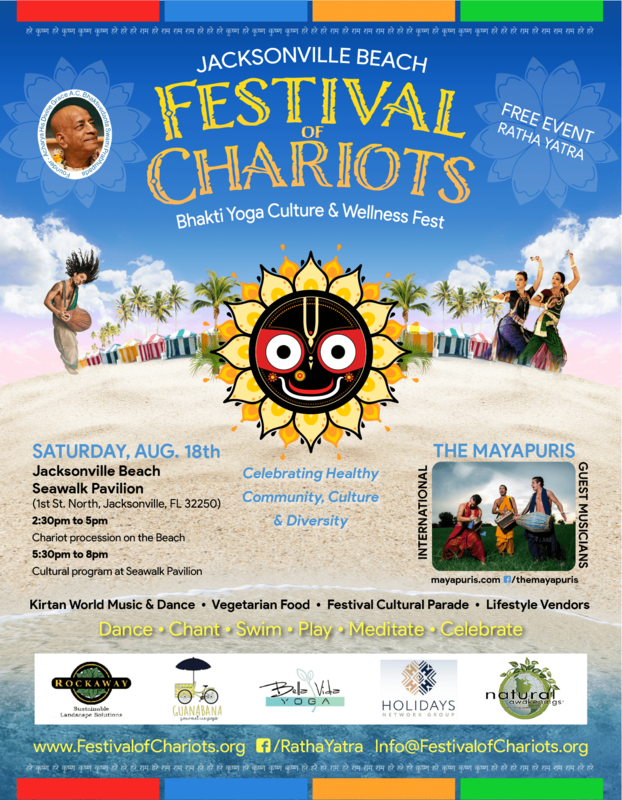 At the end of the day, it was another successful Ratha-yatra festival in which Lord Jagannath spread His mercy in the form of His holy names, His darsana, and His prasadam to the fortunate beachgoers of Daytona Beach, leaving the tourists and devotees enlivened and inspired.